Exair’s new 2½- and 3-in. Heavy Duty Line Vacs are powerful in-line conveyors that transport high volumes of material through ordinary hose or tube. Designed for rugged, industrial applications, the Heavy Duty Line Vacs have a hardened alloy construction that prevent premature wear when transporting abrasive or heavy materials like shot blast, tumbling media, or metal fittings. These units feature large throat diameters that make it possible to convey more material over longer vertical and horizontal lengths. The conveying rate is typically twice that of ordinary air powered conveyors. Heavy Duty Line Vacs eject a small amount of compressed air through directed nozzles into the throat to produce a vacuum on one end and high output flows on the other. Response is instantaneous. The material conveying rate is easily controlled with a pressure regulator. An optional bracket permits easy mounting. No moving parts or electricity assures maintenance-free operation. Seven sizes up to 3 in. are available that fit popular hose and tube diameters. 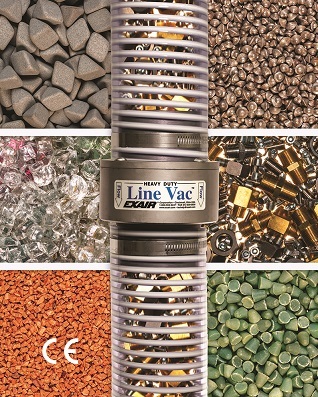 Threaded Heavy Duty Line Vacs are available for use with common pipe. Standard-duty models made from aluminum, 303 and 316 stainless steel are also available in nine sizes, with or without threads. All Exair line vacs are CE compliant, meet OSHA pressure requirements, and are ready to ship from stock.